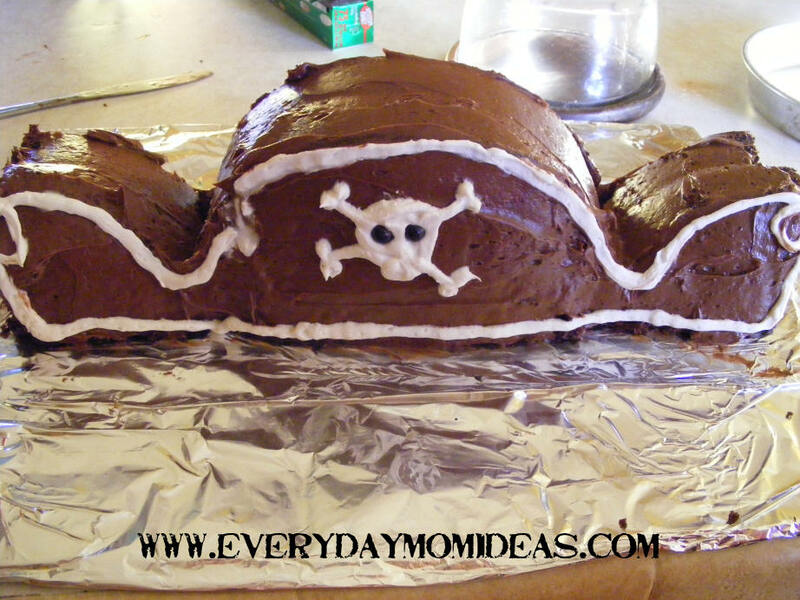 This is actually the second time I have made this pirate hat themed cake. 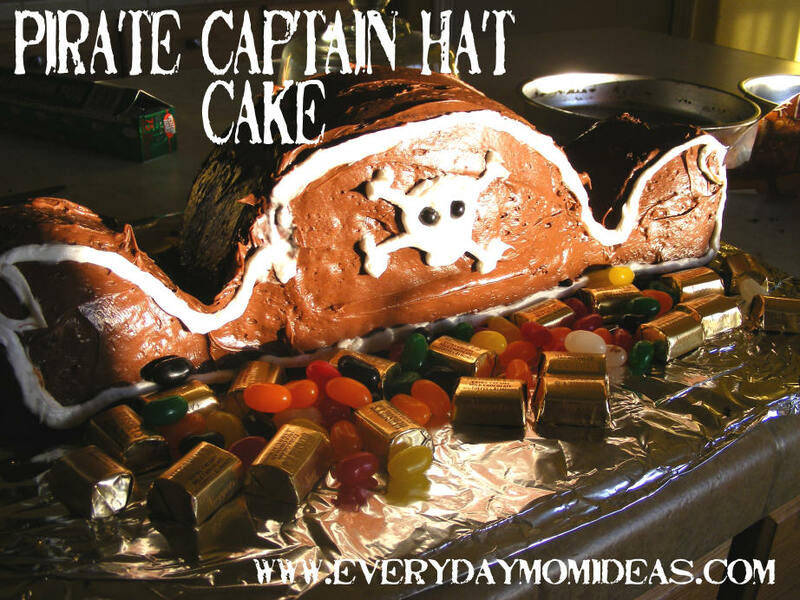 The first time was for a Halloween party for a cake walk and the second was a few weeks ago for my sons pirate birthday party. I love how easy this cake was to make. I am by no means a cake decorator and found this simple to put together. I was inspired by a similar cake tutorial I came across in the Family Fun magazine. They always have fantastic ideas! 1. 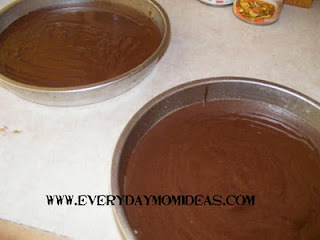 Just follow the cake mix recipe to make the cake in the two round pans. 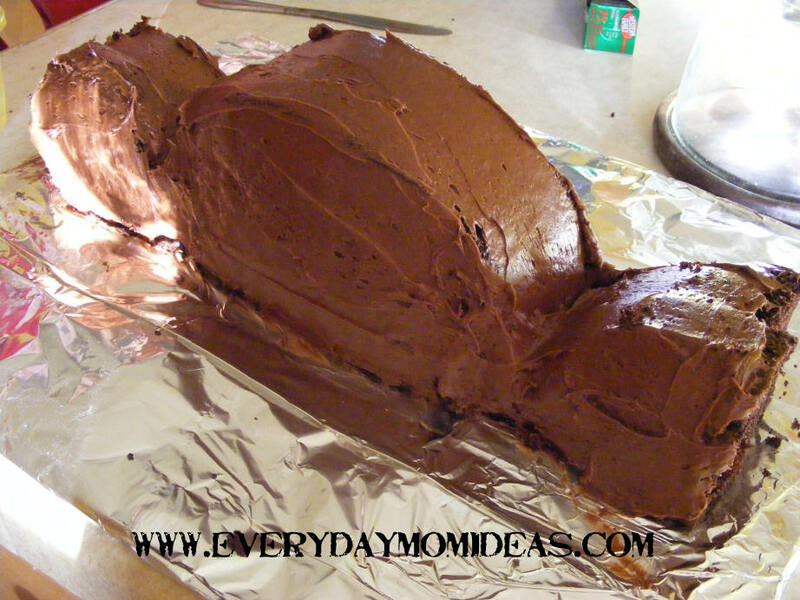 I use PAM baking spray to just to make sure none of the side stick and make the cake all funny looking. Don't forget to let someone special lick the bowl... this is very key to making a great pirate cake! 2. 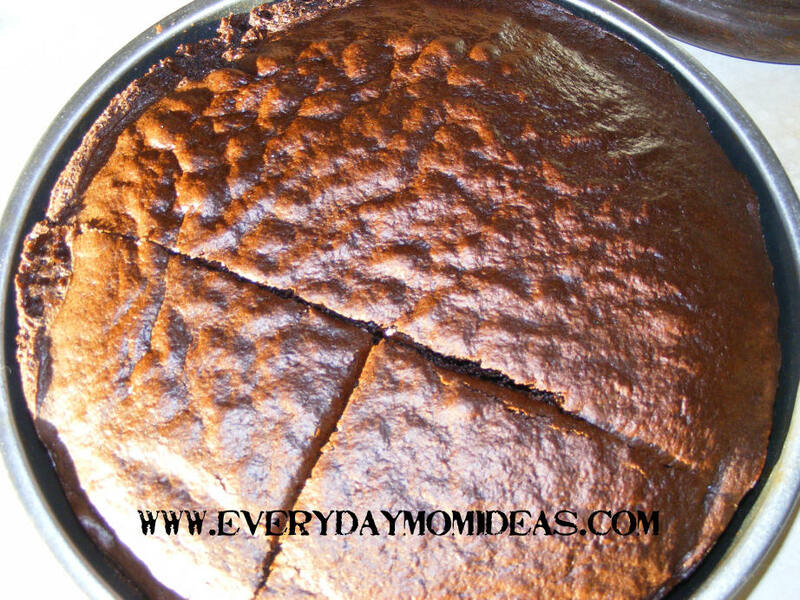 When the cake's are baked and cooled you can go ahead and cut it into thirds just like the picture above. 4. Now its time for frosting! 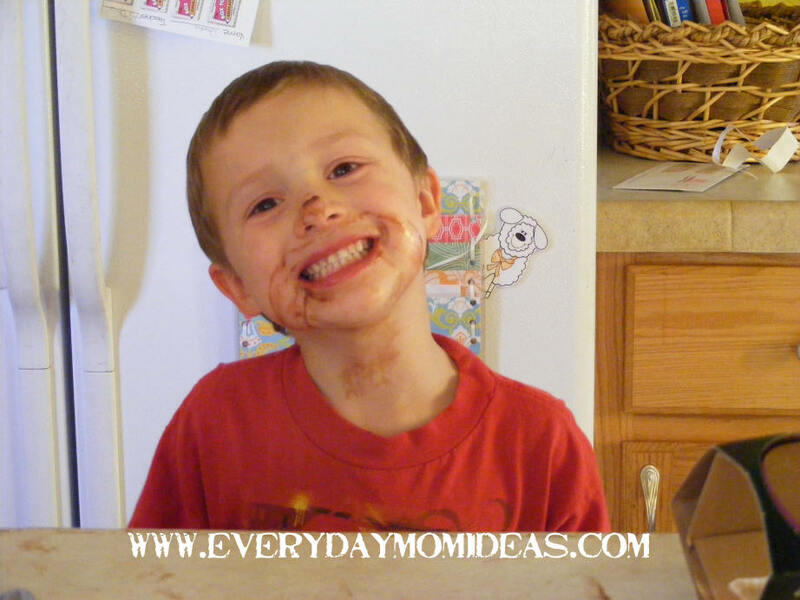 I use whipped frosting out of a container. The fluffier the frosting the easier it is to spread on this kind of cake. 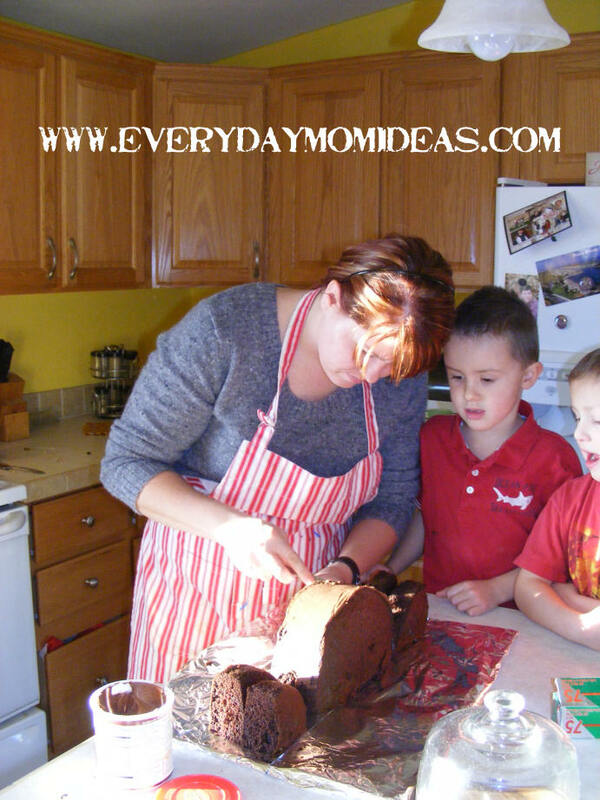 My two boys were fascinated by watching me create this fun cake. 5. I just left the ends unfrosted because they were just not taking the frosting very well. But if you want your ends covered you could always freeze the cake before frosting it to make frosting the ends easier. 6. Now you can pipe on the hat trim with the white frosting tube and draw on the skull and cross bones. I used two chocolate chips for the eyes. 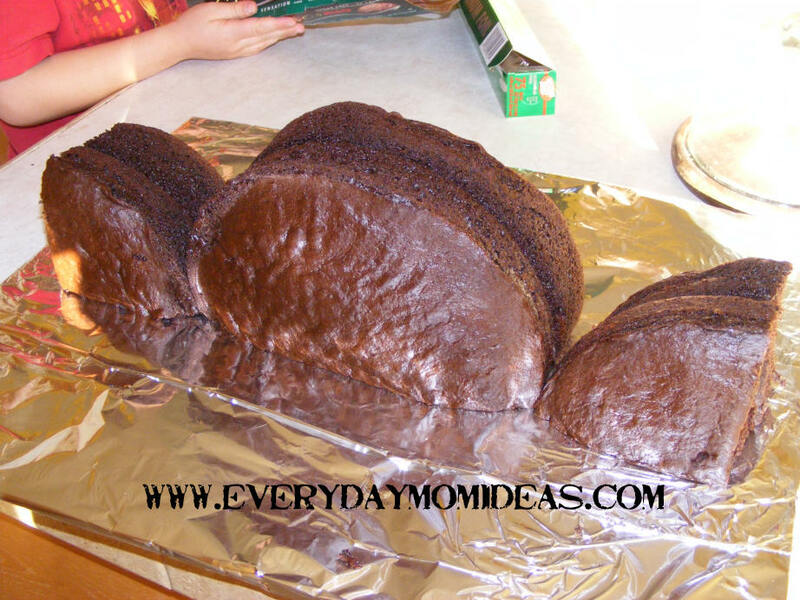 I hope you have a lot of fun with this cake. 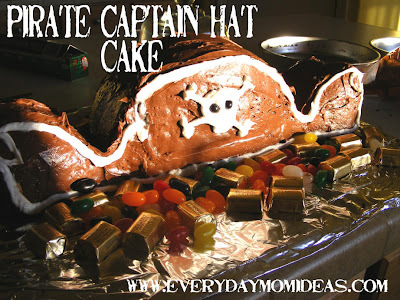 All the little kids at my son's party thought it was so neat that he had a pirate hat cake for them to enjoy. Our little guests were so cute dressed up like pirates eating their pirate cake! Oh my gosh! Just wait until you see my tutorial I'm sending you in just a little bit. That is too, too funny. I am making this the Tutorial of the Day at my blog, The Crafty Artisan. I have posted a photo and a link sending my readers to your web site. Happy Crafting!